Discipline in business & Life…Why is it so hard? Sometimes in business, even though its out passion, we lose the drive that we initially had to get our business started. We wait on life to present an opportunity or obstacle that reignites our entreprenuerial spirit and makes us go harder than we ever had…but how do you maintain that passion and fire? How do you continue that drive day in and day out? Well…I am a prime suspect in this arena. I could blame it on my inconsistent Gemini behavior, but at the end of the day, it’s my own fault. We, as people, have the power to place levels of priority on things in our lives. We do it everyday….How bad do I want to lose wait? How bad do I want to start this business? How important is it to pay this bill right now? We make this type of decisions everyday and we place levels of importance on these tasks. It is in our power to change and coures correct our lives based upon our priority levels, but what I realized is that I have to make it important to me. It doesn’t matter what anyone else see’s or believe’s. It is up to me to decide my own priorities and decide what I want my legacy to be and how much effort I am willing to place into it. I am discovering that I want to run a business, that I have to operate my life as a business owner and be dedicated to that life. I have to prove that through my daily actions and be about growing and sustaining my business. If I am not going to do that then what is the use of being self employed. I might as well continue working my 9 to 5 job nad never enjoy the true benefits of being self employed…financial stability, building a legacy, and being able to live my life the way I choose, and not the way my situation dictates based upon my financial circumstances. This life is our own…God gave us this world full of wonder and beauty for us to be able to admire it and be in awe of it’s majesty. We cannot do that if we are bound by the negative circumstances that we ourselves create. How will we ever be able to appreciate this world and all that it has to offer, if we are never able to see it for ourselves. That is what I hope being self employed with allow me to do; to show my family the world and create a legacy that my children can be proud of. Well, anyway…off my soapbox…the bottomline of this rant is that I have decided….that is a powerful statement…I have decided…that in this life with the guidance of my Lord and Savior, that I will be the master of my destiny…that I will let my free will lead me in the direction of my dreams. You know, my husband said “Life is a stage and I am looking for a better part…” I said, ” I’m not looking…I’m choosing,” and that’s because it’s our choice to live as we decide. I want more for my life…I see people everyday that have taken their lives into their own hands…living the way they choose. And so…my life begins at 32…standby. Marriage and Business…Is it possible? You know…7 years ago when I met my husband I never thought that we would share a business together, let alone our lives. I guess I had another thing coming…or God had another coming. Even I met him I knew that being an Entrepreneur was in my blood. I always wanted to be that person who needed to be in control of what mark I wanted to leave in this world. A few weeks ago I was at my Family Reunion in Williamsburg, Virginia. My family and I went up and stayed a week and had a fabulous time, but outside of the fun, there were a couple of very memorable moments. This year the committee asked that some of the older and more experienced members of the family give their “Pearls of Wisdom”. My Aunt was selected and she said something that I will never forget…and that is that if you want to do something in this world, no matter how long it takes you, keep at it. Even if you fail over and over…keep at it because eventually you will make it. That sound advice rejuvenated me…Just before my husband and I got married, I decided that I needed a little help…a partner if you will. He seemed like the most likely candidate…lol…outside of him being very intelligent and having out of this world marketing knowledge and know how. It was a no-brainer…Now, where does it go down hill you ask? Well, I will tell you…that being partners with your husband is not always what it’s cracked up to be, but in my marriage my husband is my best friend. I have never been someone to follow…I have always been more of a leader…but I have learned that sometimes in order to lead, you need to follow. He is what you say the piece to our puzzle that balances everything out. I am the risk taker…him…not so much! I am the hot blooded…creative, brainstormer who has ideas that I want to execute now and sometimes too quickly. He is my parachute. He slows me down and that allows me to clearly think my decisions through. Now, there are times when I feel that he is being a little conservative, but usually…h’s right! He has a keen sense when it comes to business and that is what makes Sofistiq Concierge is even greater. It takes great leaders to mold and grow a business. Being married is so much like running a business. You have a President and VP…Someone has to be the secretary and finance person to make sure all the admin tasks are complete and bills are paid. Someone has to be the Advisor — or I guess both husband and wife act in that role. Someone has to manage the marriage and keep it running…keep it operational, fresh and new…that’s normally the wife’s department if you get my drift! And so, here we are…3 years later and still working the business together. I’ve known my husband for the better part of a decade and there is no one I trust more than him. Key word there…trust…absolutely necessary if your husband is going to be your partner. You have to have complete trust, honesty, communication, and be willing to negotiate and compromise. Otherwise, it’s a no go! Trust me! Now, being a woman and an African American woman in business I am very independent in my decision making…but I am growing to see that it’s necessary to discuss my decisions with my husband…even if they will not affect him. I value his opinion and his suggestions and it helps me to see the other side…where there may be hidden consequences I have not considered. So, is Marriage and Business possible…yes. It is possible. It is something you must work at everyday and know that when you do step into that arena…the health of your marriage will dictate that health of your business. It is a tie…a bond…and it can be beautiful if you let it be. Ok, let me start by saying that this is officially one of my favorite venues now…the staff at Farenheit, located in the heart of Charlotte, NC atop the new Hyatt Place Hotel’s 21st floor, has created an ambiance worthy of the Elite social scene in Charlotte. It’s great for cocktail hour with friends or colleagues or for that romantic dinner for two. Outside of the ambiance and killer panoramic views of the Charlotte skyline and great drinks, there are the amazing staff and prompt service that would put Jimmy Johns to shame! Although its super spectacular and awesome, there are a few things that could stand just a little tweak. First off…this venue is gorgeous, but I feel its missing the effect of live music. You can hear live music at most upscale bars and lounges in the city, but not at this venue…at least not now! It’s missing that energy…now of course it doesn’t have to have live music all the time, but a light jazz set or some r and b wouldn’t hurt the scene. Next, the food…the menu looks delicious, but did not jump out at me. There are a couple of great options but it to me seemed limited. Of course, I seemed to see things coming out that I did not see on the menu, which also was a little disturbing. It may take me a couple of more visits to dive into their entire delicious repetoire, however, what I did have was awesome! I munched down on the sausage pizza made from flatbread. On my next visit I will be trying the pecan encrusted pork chops…the General Manager is a colleague of mine and told me they are to die for! Although there is still more to come I’m sure from this venue being so new to our fair city, I was impressed overall by my first visit. It is a beautiful venue that you can see that the developers took every care to create a relaxing and plush atmosphere. I will definitely be back and will send a few of my clients in that direction as well. Small Business Investing — Realize or Real Lies? Ok, so as Small Business owner in the Charlotte, NC area and growing, I find myself looking for more ways to expand and build my brand…as most small business owners do. There are so many options out there, but it all boils down to capital…the mean green! I started my business 10 years ago with $2000 of my own personal capital, but I’m still not quite where I want to be, hence, why I’m looking for investors or just about ready to hit the bank for a small business loan…but before I do that, and put myself in debt, I want to make sure that I am maximizing all my avenues of income by using some of my social media tools. So, taking some time to reflect on this, I decided that in order for me to be successful, I am going to have to merge these two worlds. I am going to have to continue building a solid presence, but now online on Facebook, LinkedIn, Twitter and Instagram. Just over the last couple of weeks I have gained some great insight and connections. You have to be dedicated to it…to your business. It must be treated like a 9 to 10…not a 9 to 5. It is a constant steam engine of tweets, linkedin posts, instagram videos, Facebook Likes and so on…a neverending story of pitches and powerpoints. But, that’s ok — if that’s what it takes to make Sofistiq Concierge of Charlotte the number one Concierge provider in Charlotte, then I’m all for it, but I think investors are missing that. There are so many businesses in the start up lane that are operating but just under the radar. Not really making enough to call it a “profit” but have a good foundation and starting to turn heads…they just need the capital to take them to the next level. When I first started I was that business…trying to grow and build a reputation. It takes time, effort, energy and capital. You’ve got to have the passion and you must surround yourself with like minded individuals that want to succeed. It’s not easy building a business and a brand, but that’s why we’re called ENTREPRENUERS! There are many companies out here that boast of being able to help small businesses get off the ground…some of which I won’t name…but are very well known in the small business community, but would take advantage of a small business owner by sneaky black and white print that talks in riddles and the promise of 2% APR when really it’s 13%. How is a small business owner supposed to truly grow their business? It’s time for us small business owners to wake up and realize that you are your brand…and as awesome as it is to have an investor, to be smart and make sure that its on terms that work for you. Don’t get a loan for 6 months with an interest rate of 32% and let the amount fool you! Be realistic…it doesnt make sense to borrow more than you know your business is worth! (I’m just saying)…set realistic goals…focus on brand building by utilizing social media outlets…connect and partner with others and look at inexpensive ways that you can grow your business…borrowing money should be one of your last resorts. There are plenty of reasons to borrow money, but let it be for a true need…Inventory, marketing/branding, advertising…not paying back bills. Alright Ladies and Gentleman! Stay tuned on my next topic…Are you really LinkedIn? This year has been rather a year of new discoveries so far, as I’ve slowly immersed myself in geek/nerd culture online (as a spectator only). I’ve learned new things, and developed new obsessions (I use the term loosely), found new causes to be excited about, and also discovered that even in a group of super smart kids, we still can’t agree (or agree to disagree) on certain… issues. I don’t know, I suppose I thought that people who had memorized every line from the original Star Trek series wouldn’t really have problems with sexism and racism. Beneath my tough walnutty exterior, I am a soft, squishy idealist, I suppose. So much for nerd utopia. As I read an article on NBC about a group of archaeologists who were excavating Balatlar Church in Turkey who claim to have found a piece of the cross that Jesus Christ was crucified on it moves me. Now whether or not they have actually found a piece of the cross, I’m not sure, but that’s not the point. It still moves me. 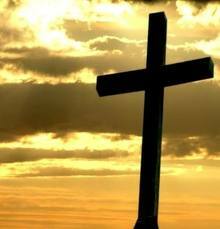 As I grow older and I have started to define my relationship with Christ. I find myself more and more connected through the events of my life. I find my cause and purpose in life to be moving me in many ways towards being more “Christ-Like”. For example, showing kindness and loves, taking care of my family, getting married, growing a deeper attachment to Christ and understanding what that means. Or even starting my foundation next year. The sole purpose of my foundation is to give back to those who are in need and to encourage others to do the same; to educate and change the world with one random act of kindness at a time, hence, www. … well I won’t give it away…but just look for it. When I am in Church, which I now attend on Saturday’s to keep the Sabbath Holy, I feel an overwhelming wave of emotion come over me. I could burst into tears right now from thinking about it, and about how good God has been to me; how thankful I am to know his love and mercy. I cannot imagine what life is like not knowing this feeling. To know for certain in my heart that he was a real man who gave his life for his people…and now to read articles like these where there are those who may prove for the natural world to see, that he was in fact a real man. It is enough for a believer to know that he is real…that he is the living God…but it is something different to the world for it to be proven beyond a shadow of a doubt that he was real because that would mean to non-believers and skeptics that his miracles and mercies were real. What do you suppose the world would be like if it was a proven fact that there is a Heaven and a hell? What would happen in the lives of the non-believers and skeptics…would the world be better? Would it be different? It’s an interesting notion…Would the world change for those who have always believed? I find it fascinating…this feeling…how you can be so complete and so full…how awesome He is…how He protects and guides and most of the time we are not even aware. How He always has our backs even when we feel that we are up against the wall…but if we were to just turn around we would see that it is not the wall we are up against…it is Him standing firm behind us…ready to push us on through our storm. Of course, no one is perfect…we are yet sinners and we can only try to live each day trying to be more and better than what we are; asking for His forgiveness when we fall short of His grace — to continue to read and know the Word of God so that we can be strong when it comes time to battle through life…so that we can learn to lean on prayer and trust that if he did it once…he will bring us through again. I know I went all “religious” on you guys today, but it could not be helped. When the spirit moves you…you must move with it. As I was on my way in to work this morning, I was listening to a local radio show called the BJ Murphy Morning Show — Now, this show is known for having very heated subjects of conversation in the mornings, and I sometimes call in and give my opinion on them. This mornings topic was why no one has come forward as a witness to the stabbing of a young man outside of the Little Wayne concert that was held in Charlotte several days ago. He was killed and all for attempting to defend his girlfriend. Now, they posed this question this morning as to why no one has come forward. The police are baffled and are seeking help from the community. Now, many of the callers this morning were calling in upset with one of the personalities because she was stating that she would not jeapardize the safety of her family by being the one that would come forward. Basically, stating that she would not ever be the one to march into the police station, (if she saw this happen), and say hey, I know who did it and so on. It’s not that I don’t get what she’s saying, I totally do, but there is still something cowardly about what she’s saying. We want to talk about blacks killing blacks every opportunity we have, but we don’t want to really do anything about it. I am always hearing, “God will take care of them!” Why are we leaving everything to Him. Yes, He is almighty and powerful and yes I absolutely believe that He will have the last say, but we as a people have to wake up. We continue to let these types of behaviors go undisciplined and we will not stand up and take the lead on anything. 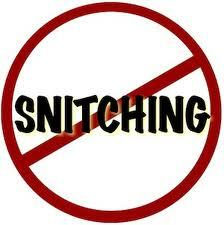 It’s really not limited to just snitching…the No Snitching campaign is just another movement to encourage criminal activity and behavior in our communities, which has gone on too long. Now, I can’t say what I would do in my situation — it would depend on the gravity of the situation and whether or not I thought it was something that I could or could not handle. There are many ways to stay involved in your community. However, the bottomline is, is if I see a man beating a woman within an inch of her life and I can identify him, I am GOING to report it and HIM! It’s just as simple as that. If I see a child being abused (which I have seen), I am going to report it and the abuser. If one will not stand, then no one will. Blacks have become a nation of followers and not leaders…we encourage street justice which in turn increases the Black on Black crime in our communities, keeping us at odds with one another. There is no compassion, courage and bravery in our community any longer…We are slowly losing our social consciousness and our ability to be morally just. Because of ignorance, lack of education, no role models in the home and no encouragement for our youth, our race is lost in a fog and they are making uneducated guesses and choices about which path they should take. We have continued to see these types of tragedies in our communities because we have too many uneducated cowards who continue to stand silently onlooking as these atrocities happen. Black on Black crime in this country is at an all time high because we have not made it socially illegal in our own communities to the point where if you were to kill one of your brothers or sisters in the Black Community there would be no place for you among your own…you would be cast out. We must get to the point where the idea of Black on Black crime is the highest crime there could be in our community and socially unacceptable. Many of us want to increase the peace in our neighborhoods and in our communities, but it first starts with our youth. We must begin to take hold of our children and teach them…inform them and make them aware and see to it that they have the tools to succeed. It is true that we can pick our own battles but we are in a war to rebuild our community and legacy as a people. Our first battle that we need to win is for our youth so that we can solidify the foundation that they will stand on. I have never been in a situation where I have had to report or “snitch” on someone committing a crime, and I know the stigma around doing that is one having fear that harm will come to one’s family or loved ones, but what would you do to save another? What would you sacrifice? Looking back on Christ as he was being beaten and crucified…would you have stepped in? Would you have given your life for Him, or risked your reputation to follow Him? Should we not apply these same principles to each other for the better of our world and society? Or is this going too far in our roles to be socially responsible?